1. Preheat the oven to 180°C and prepare a 20 × 30 cm baking dish. 2. Heat a little oil in a pot and sauté the onions for 5 minutes. 3. Add the sausage meat and fry for 5 minutes on high. Use a wooden spoon to break up the meat as you cook it. 4. Add the tomatoes, wine and garlic. Simmer for 5 minutes. 5. Melt butter in a pot over medium-low heat. Whisk in the flour, then slowly add the milk. Cook, whisking, until the mixture comes to the boil and thickens. Add the Cheddar. 6. Layer mince, lasagne sheets and Parmesan. Repeat twice, ending with a layer of pasta. Pour over the cheese sauce. 7. Bake for 40 minutes, until golden on top and crispy around the edges. 8. 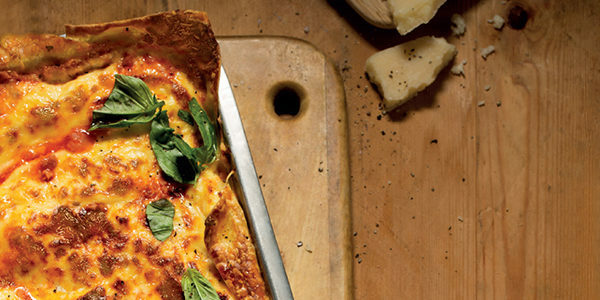 Allow to cool for 10 minutes, then serve topped with basil and the remaining Parmesan. 1. Cook the pasta according to the package instructions. Strain it, reserving cup of the cooking water. Drizzle the pasta with 3 tbsp oil. 2. Heat the remaining oil in a pan over medium heat and sauté the garlic for 1 minute. Add the tomatoes and fry for 5 minutes. 3. Add the meatballs, olives and pasta water. Cook for about 3 minutes to heat through. Season well. 4. Serve the spaghetti with the sauce, garnished with parsley. 2. Heat the oil in a pan over high heat and fry the bacon until crispy. Remove from the pan. 3. Lower the heat to medium and add the butter. Cook, continuously stirring, letting it gradually change colour and take on a rich, nutty smell. This should take about 3 minutes. 4. Place the egg yolks in a bowl and slowly whisk in the butter. 5. Add the bacon and pasta, and toss until coated. Season well. 6. Serve sprinkled with lemon zest and parsley. 1. Heat the oil in a large pan and sauté the onion for 5 minutes. 2. Add the garlic, orzo and vegetable stock. Simmer for 12–15 minutes, uncovered, to reduce the liquid and cook the pasta. 3. Add the mascarpone and season with salt and pepper. 4. Add the spinach, a handful at a time. Allow to wilt for 2 minutes. 5. Serve the pasta topped with snoek and sprinkled with chopped chillies and ground pepper. Fruity and approachable, this is a medium-bodied wine with notes of plum and blueberries, as well as hints of nutmeg and toasted almond from wood contact (40% of it was aged for 12 months in French oak). Moderate 13.5% alcohol and balancing acidity make it a great match for any tomato-based pasta sauces. Sangiovese makes up 41% of this fresh, silky blend, with 37% Merlot, 15% Cabernet Sauvignon and 7% Shiraz. The wine was matured in mostly French oak for 16 months. Besides bright red-berry flavours, fynbos and black pepper notes make it a multilayered match for lasagne. Oozing fruitcake and dark choc, this wine is a blend of all five Bordeaux varieties (Cabernet Sauvignon, with Cabernet Franc, Malbec, Merlot and Petit Verdot). It is voluptuous, but has enough backbone for ageing – or serving with our carbonara for sheer indulgence.